Update July 2013 - I am now moving all the new angel baby things over to a new blog address: http://lilysangelcloset.blogspot.com/. 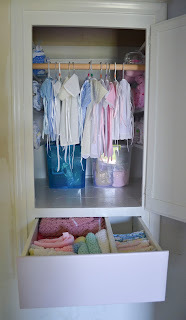 I'm planning to leave the patterns and info that are here on this blog - but for all the current updates check the new blog - which will also have donations and other patterns and information about Lily's Angel Closet - the closet in my new house full of angel baby outfits, blankets, and other angel baby crafts. It's been nearly a year since I started working on Angel Baby outfits. If you want to know why I do this, you can read that HERE. I started writing patterns to help anyone else who wanted to do this too. By now those posts are all over the blog so I thought I'd try to get them all in a place all together. I have gotten most of my information from THIS blog. Heidi Vawdrey is the one who keeps the blog up. She has a room full of Angel Baby things. Let me know if you need her contact information. I send all the outfits I make to her and she distributes them. These outfits are donated to families who have lost a baby prematurely. The outfits I make generally fit a baby born between 20 and 30 weeks. We crochet they tiniest outfits made for these sweet little babies. Bigger outfits are sewn but there is only so small that the machines can sew things. That's where these outfits are needed. 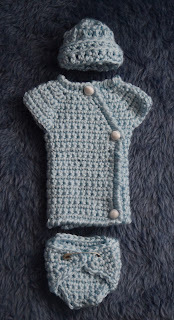 These outfits can be crocheted bigger, but it takes a LOT more time and the main need we fill is for the tinier outfits. I am hoping to get a few more pictures like these to post. I know these are personal pictures, but if you feel you could share your pictures let me know. I would be grateful to have some pictures to show why I do this. If you would like to share your story let me know. I can add links on this page for angel stories. Yarn: I use the Caron Simply Soft yarn for these outfits. It is a thinner yarn but really soft. Walmart usually has a decent price on this type of yarn. They will also price match any ad so you can get an even better deal if you're watching. Places like Joann's and Michaels also carry this yarn. They're usually more expensive but they do have sales. 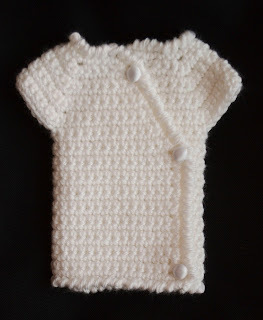 You can make these outfits out of almost any yarn - I just prefer how soft these are. If you use a thicker yarn your outfit will turn out bigger. If you use a thinner yarn they will turn out smaller. Outfits of all sizes are needed. Colors: We do a lot of white and cream outfits. 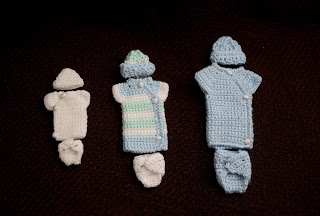 These are gender neutral which work really well for any baby. Light blue and light pink are also colors we use a lot. Many angel babies are born with bruised or discolored skin. Certain colors really don't good next to that sweet baby skin. Some Heidi has warned me to stay away from are fuchsia, turquoise, bright yellow, orange, green, royal blue, and in general, really bright colors. Another thing she warns against using is variegated yarn - or yarn with more than one color. In these tiny outfits it generally turns out looking blotchy and just doesn't work well when photographing these tiny angels. If you do want to use variegated yarn, use it as more of an accent rather than the main yarn. Or just stick mostly to the basics of white, cream, blue, and pink. Simple, muted, solid colors work best. Hats: Hats should be stretchy - very stretchy. The pattern I have on here has good stretch to it. Head are about these sizes: A small plum, an apple, a navel orange, a grapefruit, and a normal newborn size. Hats are always needed in every size. I try to make a hat or headband to match every outfit. But you could just send hats and headbands. They are very needed and basic colored hats can go with any outfit. I make the hats a little longer than I think they will need to be. Then the brim can be rolled up if needed. Blankets: Crochet blankets that match the outfits are great but not necessary. 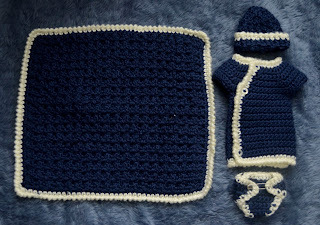 Blankets can be used any size between 12 inches X 12 inches and 24 inches by 24 inches. Blankets with tiny or no holes are best because tiny fingers and toes get caught in them. The easiest way I've found to test if a blanket will be the right size for the outfit is to fold the blanket in quarters, then lay the outfit over the blanket. The outfits should be about the same length as the blanket folded in quarters. It's not a perfect measurement, but it generally works. Note: long lacy gowns don't really work this exact same way - but if they have long sleeves the quarter should be about the same as the distance from the end of one sleeve to the other sleeve. Diapers: We recently teamed up with Teeny Tears, and organization that sews diapers for angel babies. They send two diapers out each time - one for baby to wear for burial and one for the families to keep. 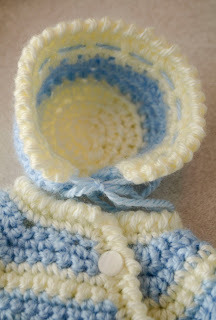 I used their pattern for a model for the crochet diapers. You can donate JUST diapers through Teeny Tears - their blog will give you all the info you need for donating through them. They also love to send outfits and blankets with the diapers. I put each outfit into a separate ziploc baggie right after I make them. This keeps them from getting dusty if it's a while before I get them sent off or before they are used. 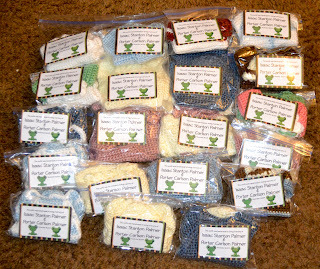 It also helps to make sure no sticky fingers get a hold of them before I get them sent. It also helps to keep all the pieces together. And this time I added a tag (best if it's in the bag with the outfit) in honor of the angels who's lives started me working on this project. You can read their story HERE. I now have a template made for these tags. If you want me to send that to you I can. If you want help making tags I can help with that too. 8 tags print on one page. 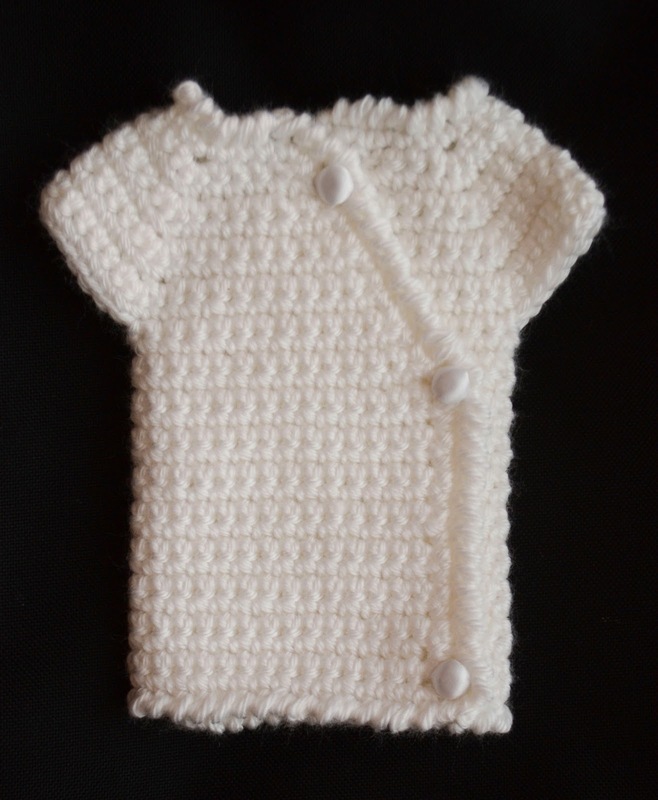 If you or someone you know is in need of a tiny outfit please feel free to let me know. 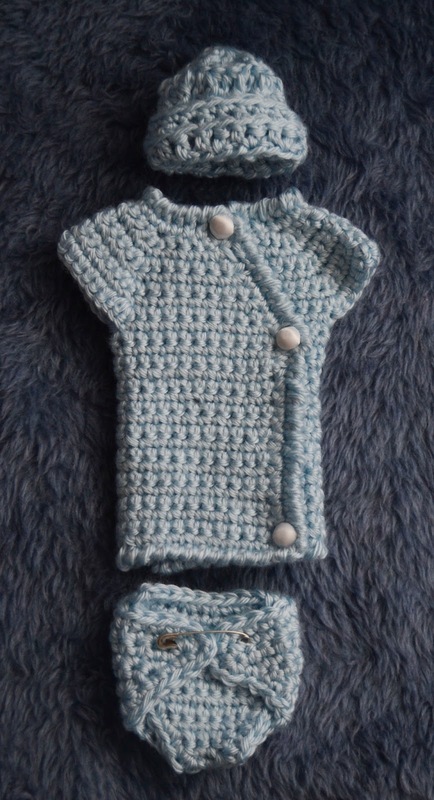 The outfits I crochet fit a baby between 15 and 25 weeks. Heidi has lots of other outfits donated that fit babies that are bigger. Both of us are willing to ship so please let us know if there is a specific need. Right now neither of us are set up to donate to hospitals or large groups - we can only help on an individual basis. If you are looking to donate you can talk to the bereavement specialist at your local hospital. They can tell you what things they need/want. Some places are pretty specific about what they will accept. If your hospital won't/can't accept outfits you've made let me know. We can always use more outfits. I hope this information helps. I imagine this page will be updated fairly frequently. Please leave comments if you have questions. And feel free to email me at lilysangelcloset@gmail.com with any other questions you have or to let me know if you or someone you know is in need of an outfit. 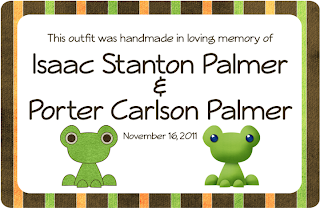 UPDATE: Jan 2013 - There is now an Angel Baby Crafter Facebook page - a great place to share ideas and ask questions!!! 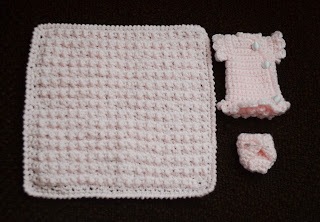 This page will have links for all kinds of Angel baby crafts, not just crochet. I would LOVE the tags to print out! I would like to use the patterns for my triplet granddaughters that are scheduled to be delivered 6 weeks early. That's if my son's GF can hold them until July 15th. No matter what, they are going to be tiny. I can send you photos of the girls in the outfits if that's ok with you :). You are a blessing to many!!!! I had an Angel Baby niece, Ashlyn Nicole. My sister was comforted by the outfit the Tucson Women' Auxillary Club presented to her. My God continue to work through your hands! I would love to have some photos! I hope the outfits/patterns work for you. 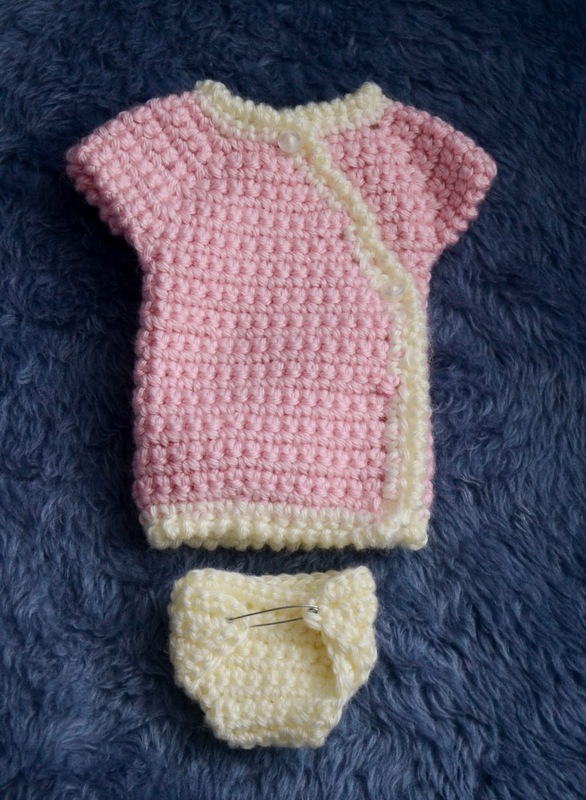 I have been making crocheted "Angel Baby" outfits for over 50 years. I started when my 2nd baby was twin girls. one made it and one died. 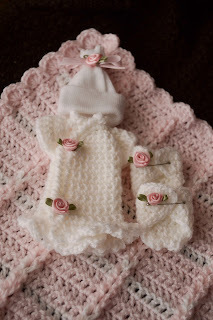 There was NO source for teeny baby clothes to bury her in, so I made a dress, bonnet and booties for her. I always have 8-10 outfits on hand - Lacey ones for girls, and elegant, but not girly for boys. Hat and booties for each. I have a tiny baby doll that correspond to 5 different fetus sizes. and use them to size my outfits. 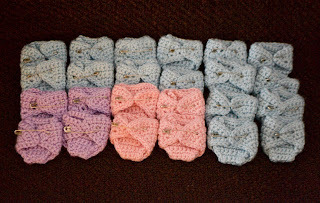 For the VERY tiny ones, I make a pretty Granny Square, turn up the bottom corner to make a pocket, tuck the tiny fetus in and fold over the side corners and tie a ribbon bow; sometimes they want to fold down the top corner, and the Bow covers that also. Hard to explain, but you get the idea. I use the store bought tiny ribbon roses to decorate all the outfits - they are cheap and quick. The boy outfis are really a sort of "Onesie". 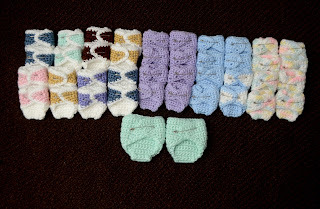 I have to be careful, how many I give to the Hospitals, because otherwise the people take them home for their kid's dolls! Can you believe that! I saw one of MY outfits on a child's doll, and asked her where she got it - "Oh, my mommy works at Hillcrest and she gets them there - I have more at home . . ."
I do not get angry easily, but THAT got me ANGRY!! - AND YES it was one I made - It had my tag on it! I am glad that more people are doing this, it is a need that needs to be filled! Thanks for helping fill that need! Lucky them, they have obviously never experienced the loss of a baby (mind you, even if you hadn't experienced it you would have to be some piece of work to steal clothes meant for babies who have died). I have just started crocheting for the Baby Unit that looked after my son before he died (there was nothing at all for Prem babies who died 27 years ago, the staff did put him in a Moses Basket - but it was very surreal because he was so small). It will give me a lot of comfort to think that I have made other parent's experience easier, even if it was only a tiny bit. I would love the tag template. Email me at lilysangelcloset@gmail.com and I can get you a template for tags, Vicki! WOW!!! I am just stunned. It never ever occurred to me that you would dress an early baby. I just thought you would wrap the baby up in a blanket. This is a wonderful program. I will pass the info along to others who are unaware. I came across your site through Pinterest. 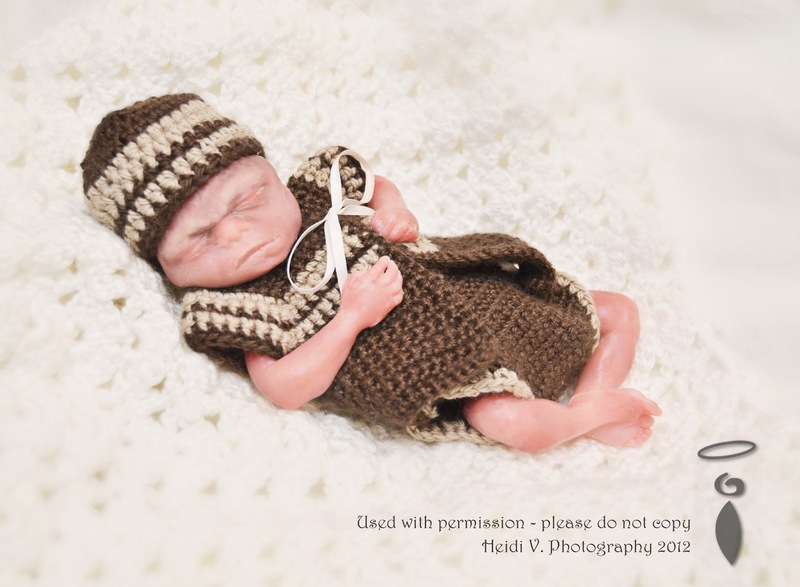 I used to crochet hats for the organization, From The Heart. On October 15, 2012, our family became the recipient of a gift from From The Heart. We lost our precious granddaughter. She was an identical twin. It was very surreal to receive the offerings of the organization for which I gave my time. Thank you for what you do. I can honestly say it is greatly appreciated. I love these patterns, but I'm a knitter. 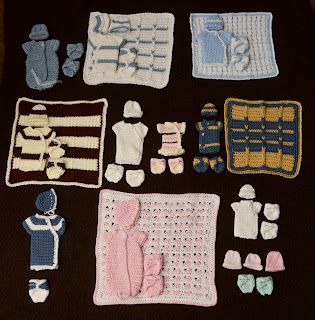 :) Have any of these been converted into a knitting pattern? I also wish you had knit patterns. I recently picked up my needles for the first time in many years to make newborn hats. Although I can (could) crochet, I'm not sure if I can anymore: I have peripheral neuropathy as a result of chemotherapy for breast cancer in my feet and legs and this past year it has progressed to my hands. They feel prickly all the time and my grip is poor, but I would like to make Angel clothes. I have found I can knit okay since the needles are always holding the stitches. Email me at lilysangelcloser@gmail.com with the kind of tags you'd like! WOW what a magnificent labor of love. Im new to angel babies never heard of this before. But will learn more. God bless everyone that helps. These patterns are wonderful, thank you for sharing them. Would you please tell me what SH means in the kimono instructions? Shell? Seems I stumbled over an explanation and now can't find it; think I've addled my wits surfing this site for tiny patterns. Thank you again! thans for posting these. They need 300 per month at each of the hospitals here. There is a need for royal blue for families from some culutures and other colors other than green or yellow because of jaundice. Many skin shade look good in the varigated and the nurses like them because they hide stains or fluids. Huge need and Project Linus supports many of the NICU depts and also the others where they see the need to provide comfort. I would love the templet for the name tags of u wouldn't mind.